KIEV, Ukraine -- Ukraine's new Prime Minister Mykola Azarov will try to persuade his Russian counterpart Vladimir Putin to review Russian gas prices for Ukraine during a meeting in Moscow on Thursday. Ukraine's new President Viktor Yanukovych, who came to power in February after narrowly winning a presidential runoff, has been seeking to revise a long-term gas deal signed by ex-premier Yulia Tymoshenko and the Russian prime minister in early 2009. In return for cheaper gas, Ukraine wants to offer Russia a stake in its gas transportation system, which currently accounts for about 80% of Russian natural gas exports to Europe. 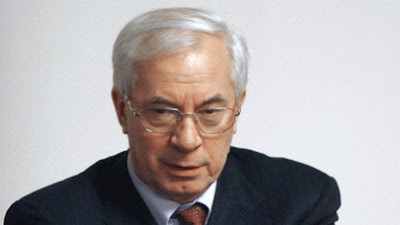 Azarov was quoted as saying on Wednesday that Russia has set unreasonably high gas prices for Ukraine, which have further strained the country's meager finances. "That is why the issue... will be on the first place during a meeting of the Ukrainian and Russian premiers," the Ukrainian government's press service said. "We expect that a bilaterally beneficial draft project [on Russian gas supplies to Ukraine] will be worked out and we will jointly implement it. We should certainly find a compromise solution, which would make the development of Ukraine's economy possible," Azarov said. Last year, Russia reduced its gas price for Ukraine by 20%, but in 2010 the market price, which fluctuates depending on oil prices, was introduced. In the first quarter of this year, Ukraine will pay $305 per 1,000 cubic meters of Russian gas. The price will grow to $320 in the second quarter due to rising oil prices. Ukraine's gas transportation system is Europe's second largest gas pipeline network and the main route for Russian natural gas supplies to European consumers. In early 2000, Kiev and Moscow discussed the possibility of creating a gas transport consortium with the involvement of EU partners to manage and modernize Ukraine's Soviet-era gas pipeline network. The project was put on hold when West-leaning president Viktor Yushchenko came to power in Ukraine in 2004. Russia has made repeated attempts to obtain a stake in the Ukrainian gas pipeline network to modernize the system and ensure uninterrupted gas supplies to Europe. Ukraine has so far resisted, saying a consortium with Russia would jeopardize its sovereignty. According to a poll conducted in Ukraine earlier in March, only 40.5% of respondents welcomed the idea of a gas consortium with Russia. 23.3% opposed the move. Azarov was appointed prime minister after Yanukovych's chief rival, then Prime Minister Yulia Tymoshenko, was dismissed after a vote of non-confidence on March 11. Yanukovych has repeatedly claimed he wants to boost ties with Russia, which deteriorated during his predecessor Yushchenko's presidency.